Search results in Outlook for Mac return limited or no results on Mac OS Mojave. Microsoft is aware of and investigating the issue. In no case should anyone at the University Join the Office insider program, outside of designated individuals on designated test machines. Microsoft uses the Insider program to test out new feature releases, as well as, updated code to identify issues before production release. As we have seen in the last few releases, Insider track versions have had major issues that cause clients to cease functioning properly. Insider Track Versions of Office 2016 for Mac, or any issues as a result of running the insider track will NOT be supported by Northwestern IT. Behavior: Calendar items appear on with a red box stating problem was detected and fixed. Resolution: The Calendar Repair Assistant automatically detects and corrects inconsistencies with single and recurring meeting items for mailboxes. As a result, recipients won't miss meeting announcements or have unreliable meeting information. The Calendar Repair Assistant uses the organizer's copy of the calendar item as a master copy for all meeting items. The assistant compares the attendee's calendar item with the organizer's calendar item for inconsistencies. The only exception to this rule is when the assistant compares the attendee's and organizer's response status. The assistant assumes that the attendee's response status is the correct one, and, if necessary, updates the organizer's tracking information. Behavior: Outlook 2016 users cannot see calendars shared with them by other users in the Collaboration Services system. Resolution: Outlook 2016 users must be granted "Reviewer" access to another person's calendar to be able open that calendar and view details. If a user only sets permission levels to allow free/busy or free/busy limited details, an Outlook 2016 user will not be able to see any details of the shared calendar. PC users must grant "full details" to the Outlook 2011 user. Mac users must grant the "Reviewer" role to Outlook 2016 users. Basic free/busy time viewing is only viewable via the Outlook 2016 Scheduling Assistant feature, or via OWA. (Note: Outlook 2016 users who have a "Reviewer" role may also be able to select another users name within the SEND AS / FROM drop down menu. Unless you have explicit permissions to Create Items within the selected users mailbox, Exchange will not allow you to send on the behalf of the person). Behavior: Attendees are not kept current with changes made to recurring meetings by meeting schedulers. New security enhancements have been applied for all Northwestern Collaboration Services account holders. A mobile device PIN is required to protect University data from unauthorized access in the event that your mobile device is lost or stolen. If you choose to opt out of setting a PIN or password on your mobile device, you can use the Outlook Web App (OWA) from your mobile device to access email and calendaring events. The default fifteen minute inactivity time out period is the greatest allowable setting that is compatible with the most prevalent University mobile devices and cannot be increased. Behavior: Some Android users with older versions of the operating system, or users with custom ROM's have reported that ActiveSync will not configure properly. Resolution: Users should run the Exchange ActiveSync Analyzer and verify if they are able to connect. If they make multiple attempts to connect unsuccessfully, they can download Touchdown or Moxier Mail from the Android marketplace. Both are paid applications, but have free 30 day trials. Android support is best effort. Behavior: Installing the April 2015 Lync 2013 update to Skype for Business causes Outlook 2010 to stop working. Resolution: Users that manually install the Skype for Business update patch for Lync 2013 while simultaneously using Outlook 2010 will need to uninstall Office 2010. Office 2013 should be installed to replace Office 2010, and then updated to the latest version to use Lync 2013. NUIT does not recommend using Lync 2013 with the Office 2010 version of Microsoft Outlook. If Office 2010 is required for a particular reason, reinstall the software, and then install Lync 2010 for instant messaging rather than Lync 2013. Behavior: In some situations, users may experience unexpectedly canceled meetings and events on Apple devices running iOS 6,7,8. 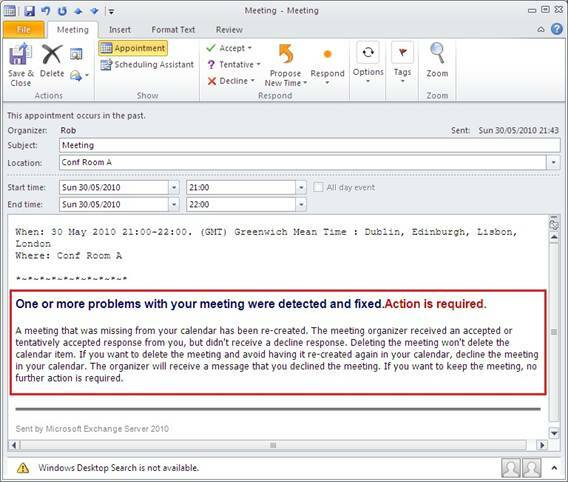 This can occur when the meeting invitation includes a manager with one or more delegates and the event is initially acted upon in Microsoft Outlook by a delegate. Resolution: This is a known issue with Apple. Users should keep their device operating system updated with the latest release recommended for their device as a first step to try and resolve this issue. If a user notices that the mobile version of their calendar is out of date, they should go into their mobile device Exchange account settings, turn off calendar synchronization, save the settings, and then turn calendar synchronization back on. iOS users should also avoid synchronizing Exchange Calendar Data through iCloud, as this may cause unforeseen calendar issues.